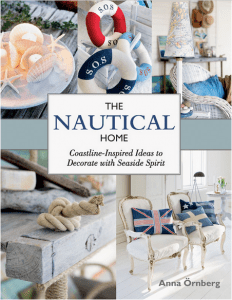 I’ve blogged recently about Beach Style Decor and Beach Style Textures and Home Accessories so I thought it might be fun to see what new books have been published this summer to add to the nautical decor inspirations! 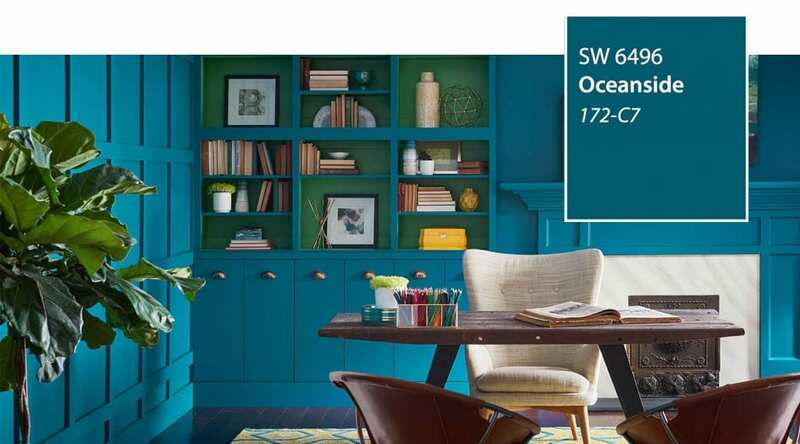 That’s the perfect title, although the subtitle might be even better: Coastline-Inspired Ideas to Decorate with Seaside Spirit. 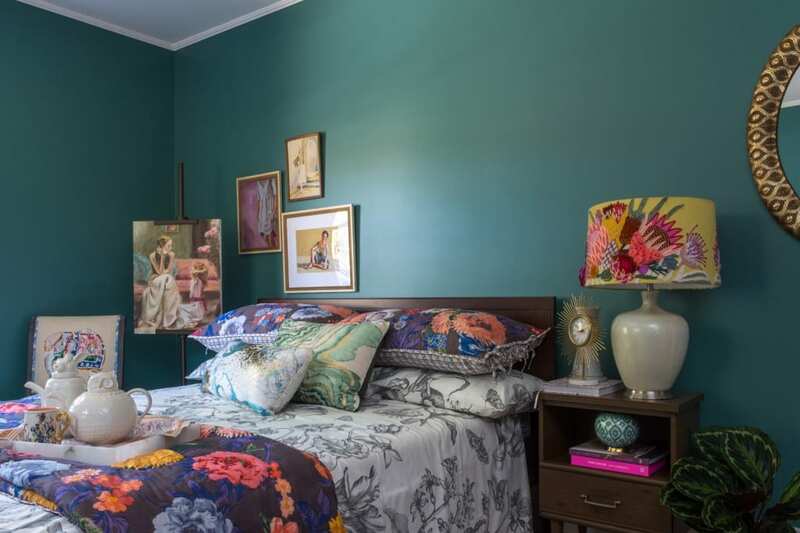 The book is written by Anna Örnberg, the author of many interior decorating books and a keen flea market shopper. Readers who own a coastal home will obviously be interested, but the book is also intended for those who live in a city or a land-locked town, while dreaming of the salt air and laid-back lifestyle of the beach. 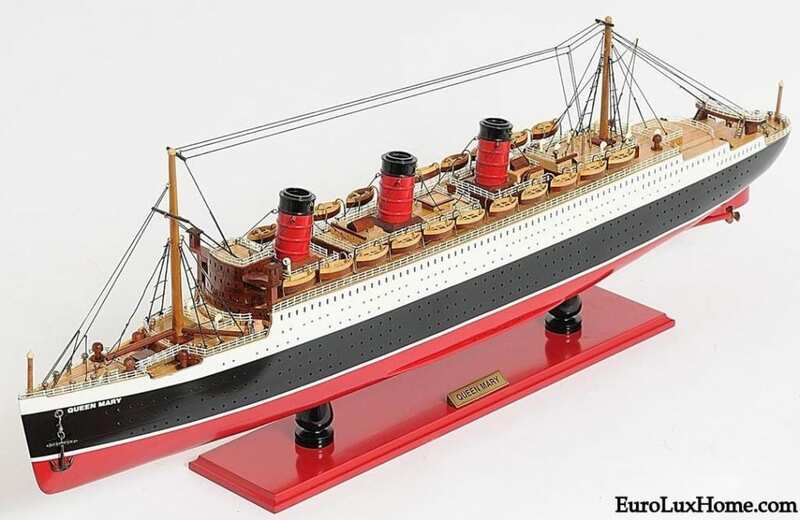 Anna writes about color schemes, materials, and the finishing touches to capture a life on the ocean wave! 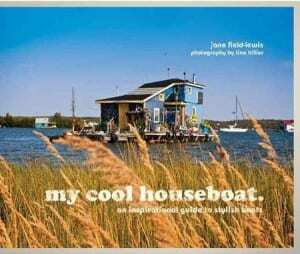 If you are lucky enough to own a houseboat so you literally live or vacation on the water, here’s the newly-published book for you! As well as giving tips on how to live stylishly and practically in a small space on a boat, the book offers a tour of houseboats on waterways from as far afield as California, New York City, London, Paris, Amsterdam, and Berlin. The author Jane Field-Lewis is a film and photography stylist who has also written books about cool caravans and sheds. I wonder what compact outdoor spaces she’ll write about next? 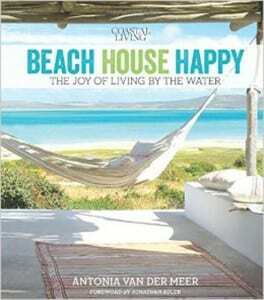 Beach House Happy is written by Antonia van der Meer, the editor in chief of Coastal Living magazine, so she should know what she’s talking about! Antonia sails us around the world to look at the homes of people who are happy to live by the water and who know how to decorate their coastal nests to make every day feel like a vacation. This coffee table book offers 224 pages of sunny inspiration from Florida, Georgia, Cape Cod, California, Mexico, South Africa and many other coastal gems. Now I think I’m ready for a piña colada and a hammock! 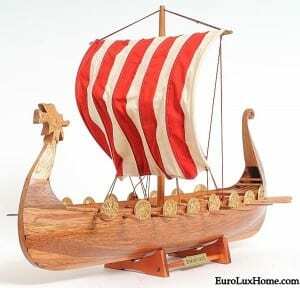 This entry was posted in Bookshelf and tagged beach style, books, coastal cottage, decorating books, design books, design inspiration, interior decorating resources, interior design books on August 4, 2015 by admin. Following on from my last post about Beautiful Beach Style Decor, let’s take a look at the materials, textures and home decor accents that help create a happy and summery beach style in your home all year round. I don’t think I’ve ever met anyone who doesn’t like this look… it’s just so comfortable but crisp and clean. It’s truly an all-American design style to appeal to everyone. In my previous blog post about beach style decor I mentioned how rattan and wicker furniture immediately conjures up a laid-back beach mood! 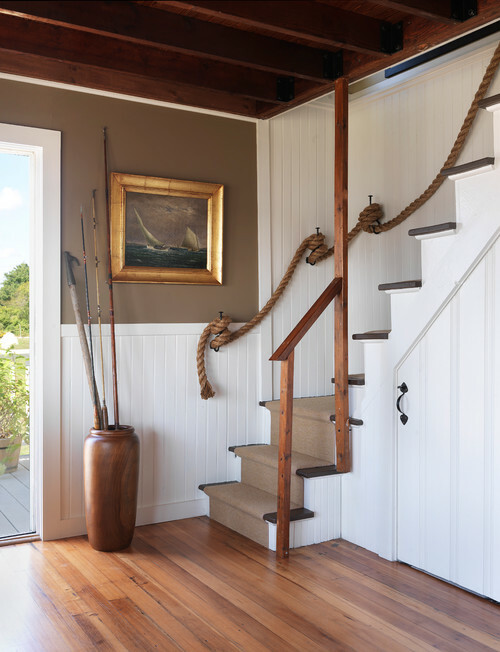 Rope details do the same thing – I can almost smell the salt air in this entryway, can’t you? Just a simple rope bannister provides the perfect detail, contrasting with the white wainscoting, wood plank floor, and a few fishing rods thrown casually into a tall vase. 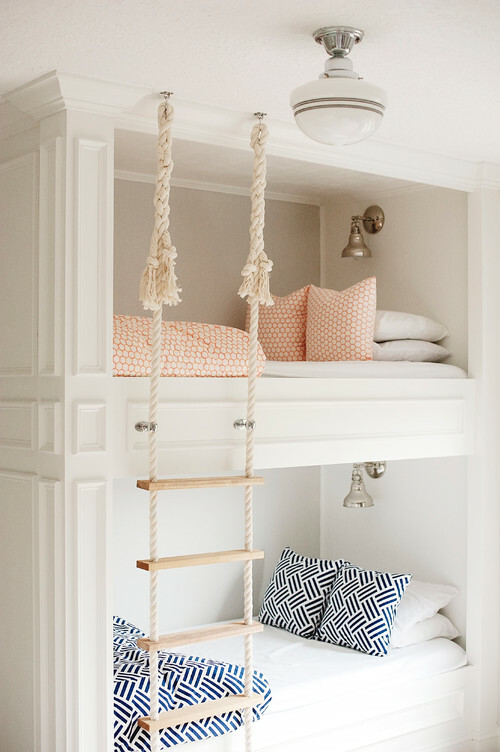 The rope step ladder on these bunk beds is sure to delight the kids when bedtime rolls around! 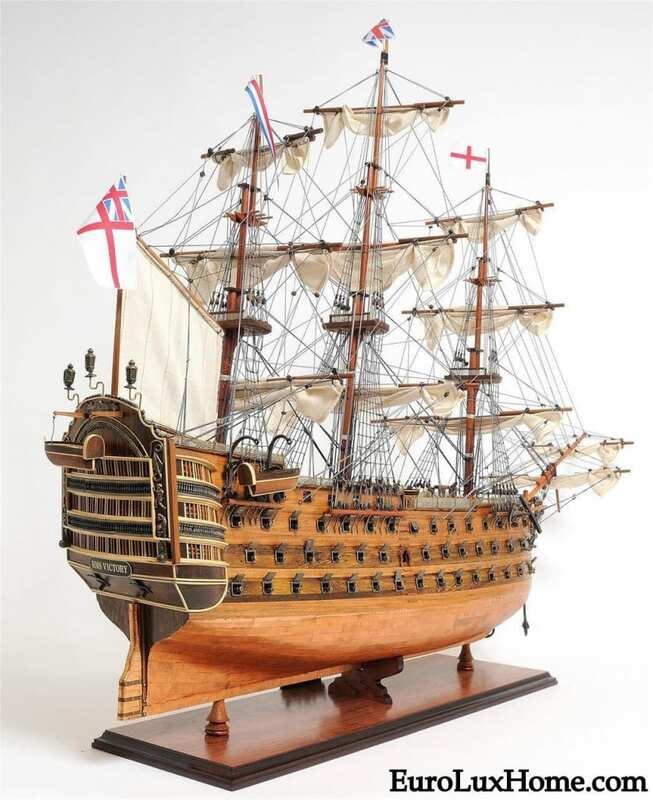 The ship bells hung over each bed adds another lure to the youngsters… you won’t be able to keep them from rushing to brush their teeth and climb into bed. I just hope for the adults’ sake that the bells don’t have real clappers inside them. But then again, where’s the fun in that? 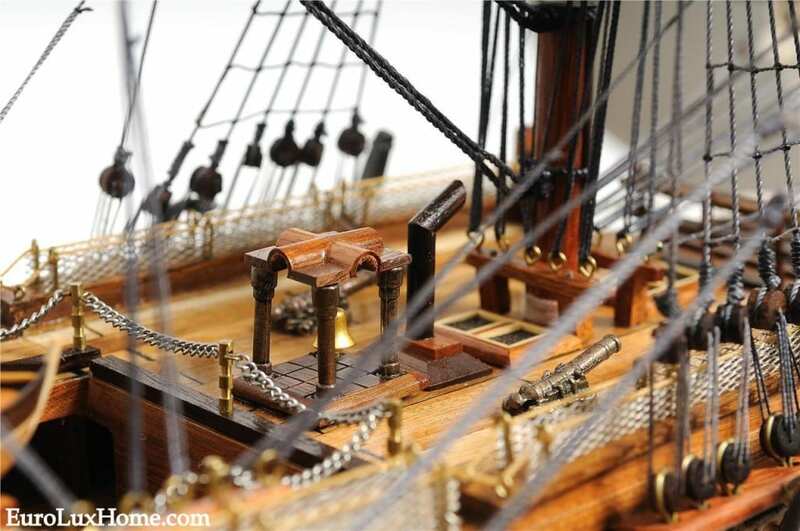 All aboard, mateys! In general the rough textures of rope, wicker and rattan make a great contrast to crisp white cotton textiles and the sharp lines of navy and white striped upholstery. You don’t have to festoon the house with rope. 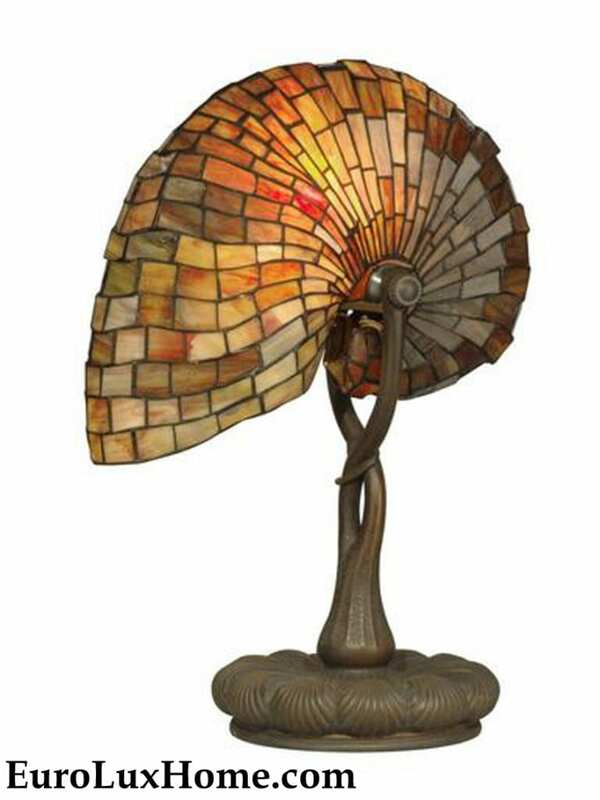 A small detail like this unusual Currey & Company wall sconce sets the tone. 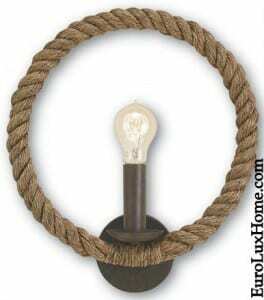 The iron and rope sconce light is understated but the simple circle of rope and the iron fixture makes us think of ships, lighthouses, and life by the sea. A day of beachcombing is bound to turn up some driftwood, Bleached driftwood furniture and decorative details add to the weathered look that that makes beach style so comfortable and distinctive. 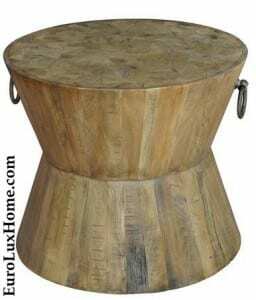 For example, this driftwood stool is made from genuinely worn reclaimed old wood. The iron rings accent the beachy feel and make the stool easy to carry around for wherever you need it. At 24 inches high, the nicely shaped stool can also be used as a convenient side table for drinks when friends come to visit after a day of fun in the sun and sand. 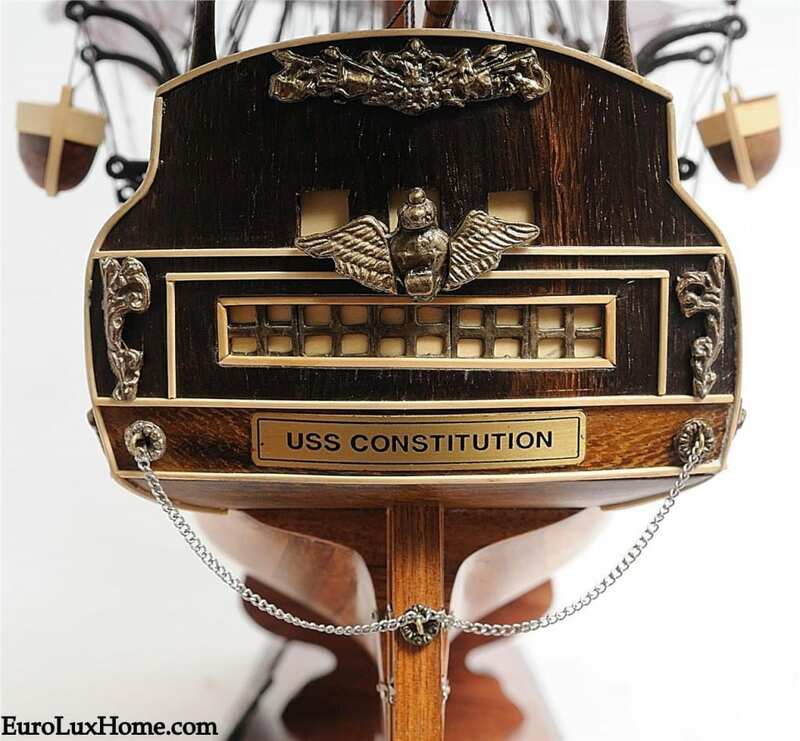 Finally, choose some decorative finishing touches that evoke the beach and ocean life. 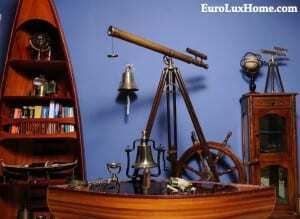 Maybe add a jar of shells or a coconut scented candle or get creative with your old surf board. 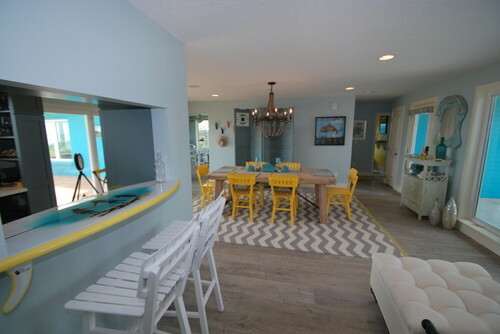 This clever homeowner in Orlando, FL, turned a surf board into a bar for the final touch to their beach style house. Notice the driftwood toned floor and all the beautiful turquoise and white to give that lazy summer day feel. 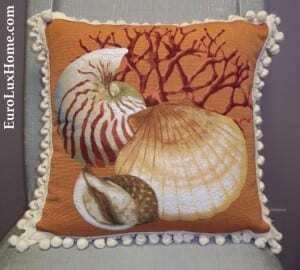 If a surf board bar is a step too far, then some throw pillows with vistas of sea life will do the trick. 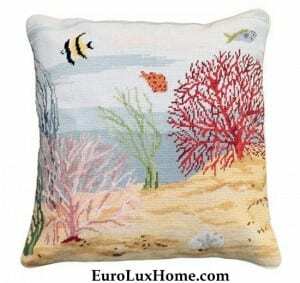 This handmade needlepoint pillow is one of a selection of ocean life pillows we stock. It’s made with pure wool with a velvet back and the color and detail of the handmade needlepoint pillow is gorgeous. The coral reef and the angel fish look lifelike enough that I feel I should be wearing a scuba mask! 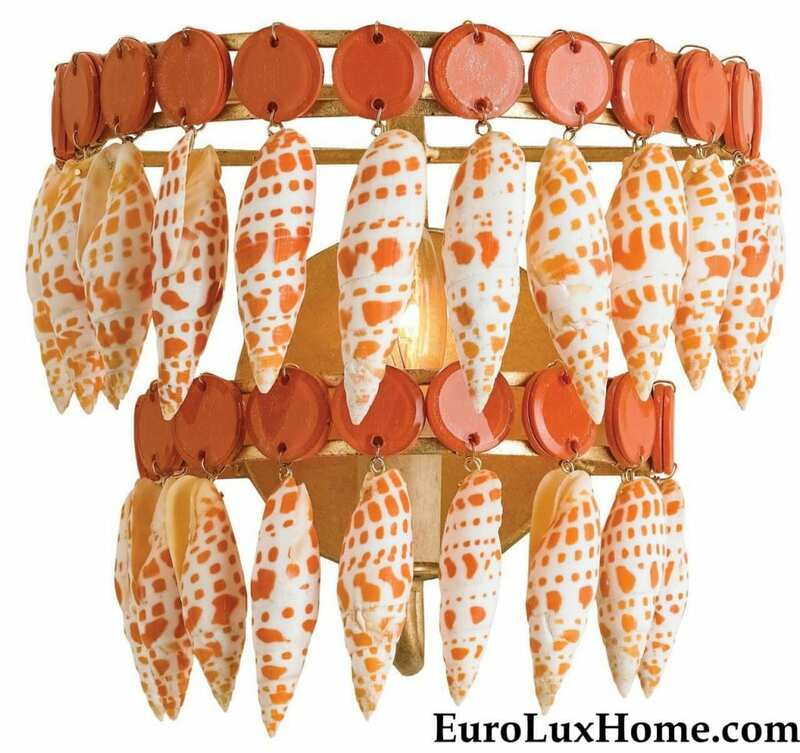 Have you decorated your home with beach style? Or maybe you actually have a beach home and you’ve had fun decorating it? Tell us about it in the comments! 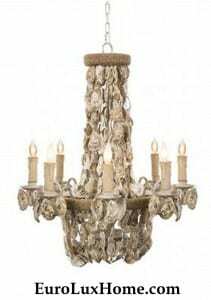 This entry was posted in Home Design Ideas and tagged beach style, creative home decorating, Currey and Co, home decor accessories, interior decor, interior design, light fixtures, lighting, natural wood, throw pillows, wall sconces on July 31, 2015 by admin. Whether you live near the ocean or are enjoying summer in the city, beach style decor is always a refreshing and comfortable look. I’ve been thinking about the elements of beach style that make this relaxed and cheerful look work. Here are some tips for year-round summer beach style. Let’s start with blue and white… of course! 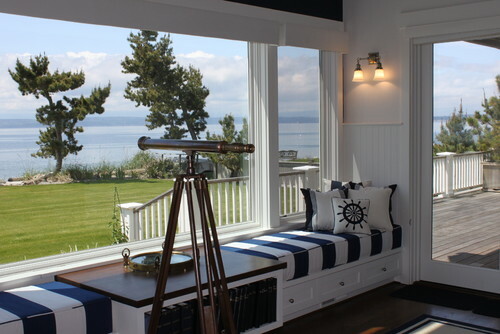 These classic nautical colors quickly make any space look crisp and breezy. This home on Whidbey Island in Washington has a wonderful view and a telescope to explore every inch of that view. But even if you aren’t lucky enough to overlook the water, I can also imagine curling up cozily on the window seat and watching the the clouds or reading a book. Blue and white stripes add another nautical touch. A ship’s wheel design on the pillow also looks cute. 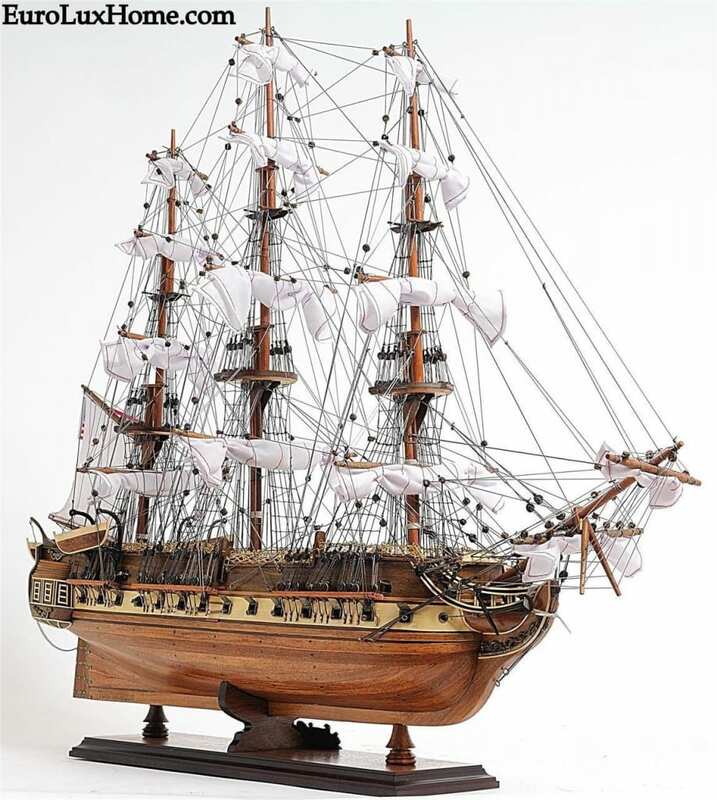 Fans of Brittany style antique furniture will know that the ship wheel is a popular motif for the sea-faring French region too. The telescope in the Whidbey Island house looks so authentic… here’s a reminder that we have some antique-style telescopes in our online store if you are looking to buy one! 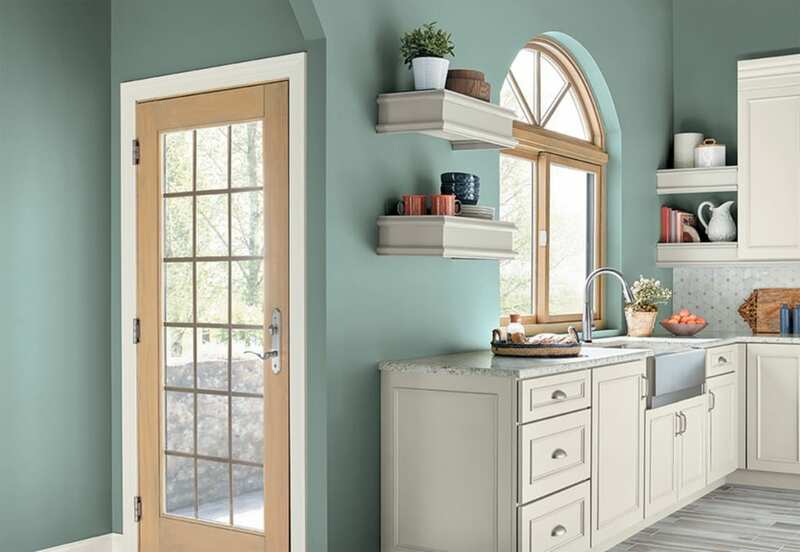 Pale blue also works fabulously for beach style. There’s a reason that they call it aqua! 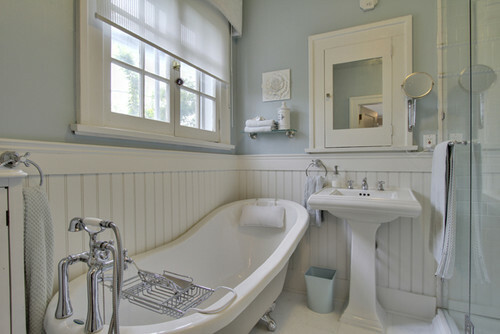 The delicate blue color in this Calgary bathroom is Gossamer Blue by Benjamin Moore Paints. The clean white trim and white wainscoting also lends a beach cottage feel. White beadboard always looks so fresh. In a similar vein, this new Stanley Furniture nightstand is a perfect choice for a beach style bedroom, or even as a handy side table in a bathroom or hallway. 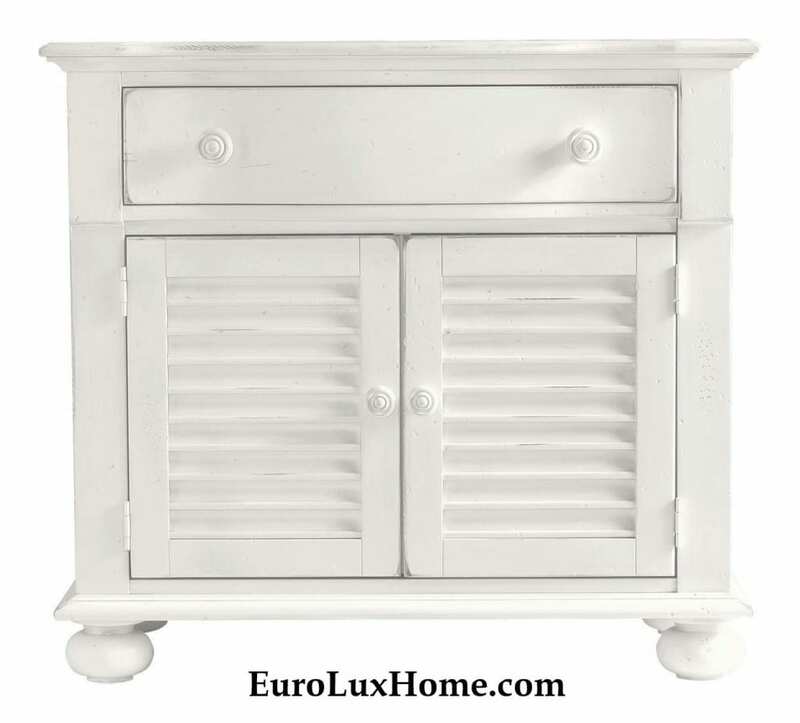 The white louvered cabinet doors remind us of shutters on coastal houses. 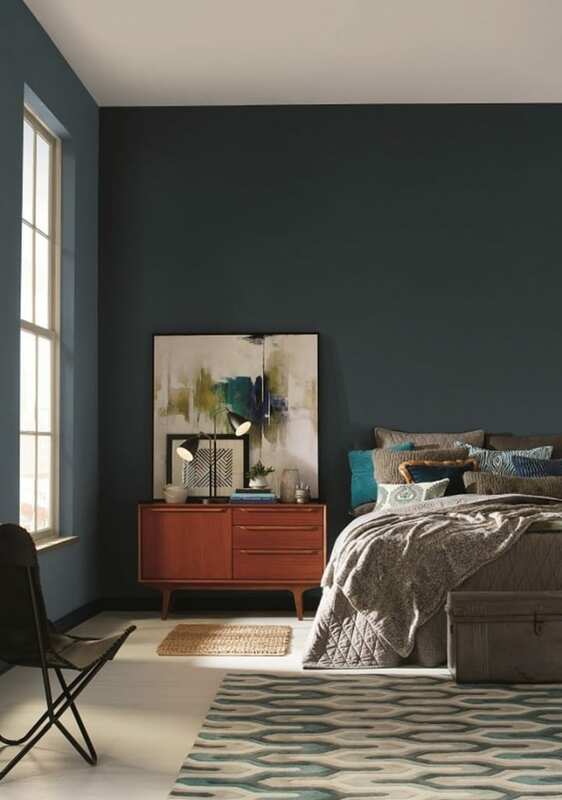 The nightstand is also available in other beachy colors: teal blue, tropical Spanish orange, and Gloucester gray. 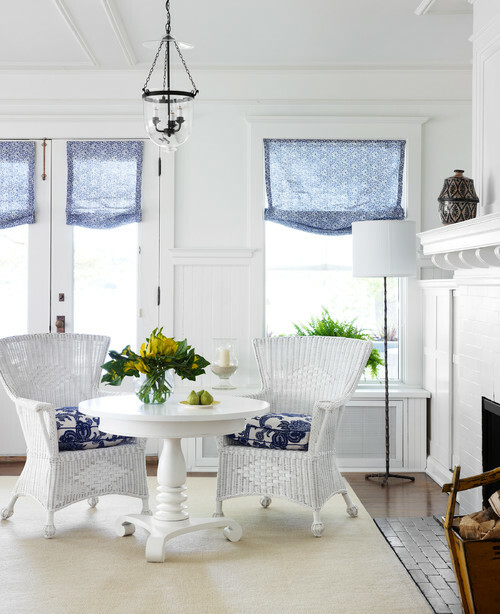 This beach style decor in this turn-of-the-century cottage once again shows the summery mood created by blue and white. It’s so easy, yet so elegant! White wainscoting and a brick fireplace create visual texture, as do the wicker chairs. Wicker and rattan are always practical and attractive choices for a coastal home. 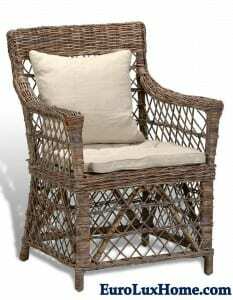 This new rattan armchair that we stock has a rustic and casual feel that will be a great match for beach style decor. 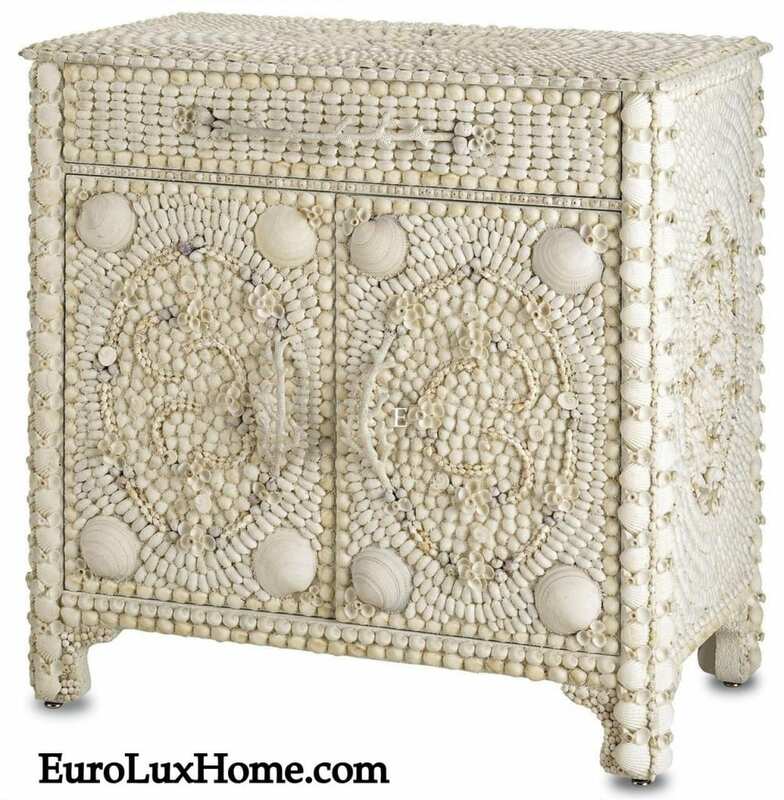 Pop it on the porch or use it as an accent chair in the living room. Or just relax in the rattan armchair in your tropically inspired bar area! It’s such a versatile piece. 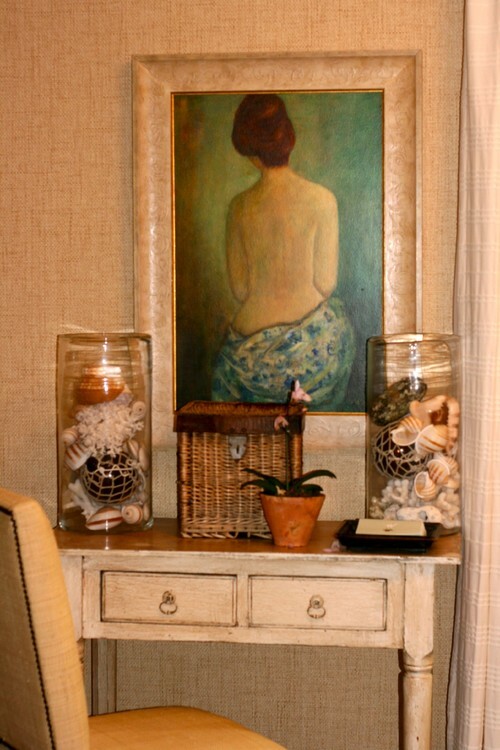 That’s part of the beauty of beach style decor… it works well for all kinds of spaces and all kinds of people. In my next blog post I’ll look more at the materials and textures that quickly create beach style in your home, as well as the finishing touches of beach style home accessories. Till then, mind the waves! This entry was posted in Home Design Ideas and tagged beach style, Blue & White Design, blue decor, coastal cottage, high quality reproduction furniture, home decor, home decor accessories, interior decor, interior design on July 30, 2015 by admin.